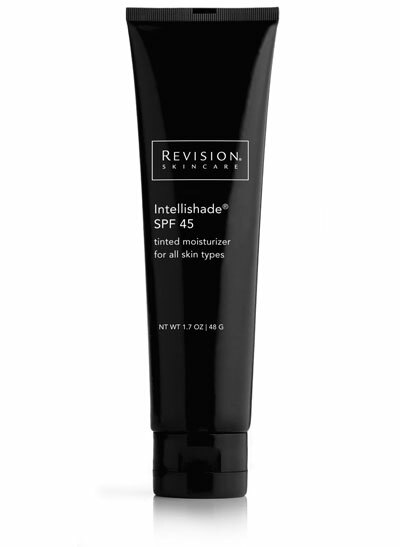 Intellishade® SPF 45 by Revision Skincare is absolutely our favorite sunscreen. This multi-tasking cream is really popular with active, on-the-go women because it does three things with one application: It’s an anti-aging moisturizer with powerful wrinkle-reducing peptides, a sunscreen and a great tinted makeup base. Talk about easy! 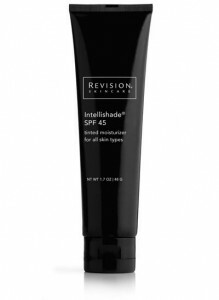 Intellishade combines SPF 45 with UVA and UVB broad spectrum coverage an IPF (immune protection factor) for complete sun defense. Micronized zinc oxide provides maximum protection while maintaining a lightweight feel. And it’s formulated with a unique blend of antioxidants for added sun protection. Intellishade®incorporates smart tint technology that matches every skin tone. The mineral tint gives your face a healthy glow and helps to even out coloration. The product comes in both Radiant and the recently launched Matte formula, which uses the latest pore-minimizing technology for a flawless finish. ACS-456 — a synergistic blend of ingredients — increases collagen synthesis to reduce the appearance of fine lines and wrinkles, and strengthens the skin’s own natural defenses. The powerful peptide Palmitoyl Tripeptide-5 helps improve skin elasticity and firmness and activates the skin’s own growth factors for increased collagen production. So why use three products in the morning when you can use just one? Come by and pick up some Intellishade. Your skin will be glad you did! This entry was posted on Sunday, July 21st, 2013 at 2:54 pm	and is filed under Skin Care Regimens. You can follow any responses to this entry through the RSS 2.0 feed. Both comments and pings are currently closed.